Irène Cherpillod founded in 2014 AFI Partnerships, a company offering expert consultancy and training services in Corruption and Fraud Prevention. AFI Partnerships offers tailor made solutions for companies and organisations, including risk assessment, staff training, the development and support in the implementation of codes of conduct, due diligence process, the implementation of fraud alert systems and the evaluation of anti-corruption measures. In addition to consultancy work and training for several NGOs, AFI Partnerships develops tools for companies, specially designed for Small and Medium Size companies to allow them to comply with international standards and the Swiss law with regard to Corruption. In 2014, AFI Partnerships was mandated by Streamhouse AG to elaborate several training tools for the Regional Initiative against the Illegal Exploitation of Natural Resources, a program of the International Conference on the Great Lakes Region, Africa. Irene Cherpillod has extensive experience in international cooperation and development. She worked with partners of various countries. In Asia: Pakistan. In Africa: South Africa, Zimbabwe, Zambia, Kenya, the Democratic Republic of Congo, the Republic of Congo, Cameroon. In Europe: the United Kingdom, Austria and Switzerland. In 2012, she was recognised for her work in combating corruption in Congo with the “Prix Stop Pauvreté 2012” (Stop Poverty Award 2012), Switzerland. As head of an Anti-corruption task force of Partner NGOs of Bread For All Switzerland, she advised several organisations, developed tools and trained staff of various Swiss and Southern organisations. She was during four years the project manager at the headquarters of a Swiss NGO, monitoring, evaluating and supporting various partners in Africa in the implementation of Development programs. She started her career as a risk analyst at a Swiss bank, evaluating and monitoring the risks of more than 80 countries and formulating recommendations for international investments. Irene is a board member of Equiterre, a Swiss NGO working in the area of sustainable development in Switzerland. She is an active member of the Cercle Suisse des Administratrices andTransparency International Switzerland. 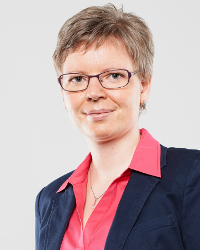 Irène holds a MSc in Economics from the University of Lausanne’s Faculty of Business and Economics (HEC). She obtained in 2014 the Certificate of Advanced Studies ETH in Development and International Cooperation from the Swiss Federal Institute of Technology’s Centre for Development and Cooperation (NADEL Institut), ETH-Zurich, Switzerland. Deeply interested in ethics, she studied theology and obtained in 2008 the Certificate in Theology from the Institut Biblique et Missionnaire Emmaüs in St-Légier, Switzerland.